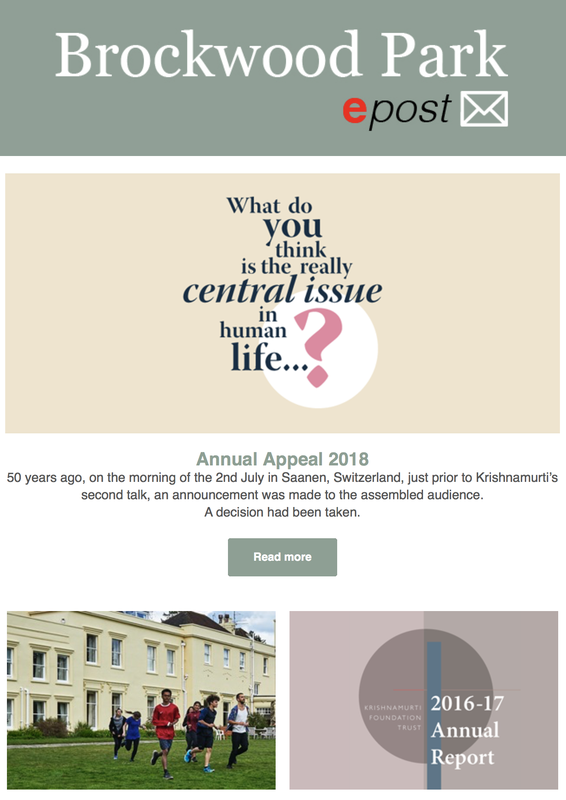 A quarterly e-newsletter informing about the work of the Krishnamurti Foundation, Brockwood Park School, the Krishnamurti Centre, and Inwoods Small School. 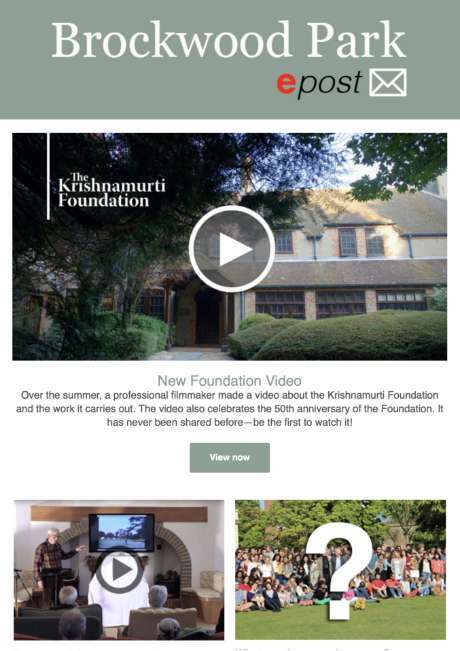 Over the summer, a professional filmmaker made a video about the Krishnamurti Foundation and the work it carries out. The video also celebrates the 50th anniversary of the Foundation. It has never been shared before—be the first to watch it! Former Brockwood staff member and current trustee, Gary Primrose, gave an insightful presentation. 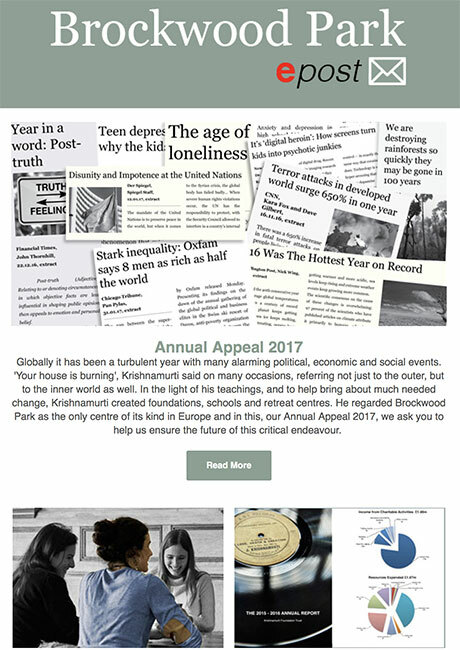 The stories of former students have appeared in The Brockwood Observer for years, but now we are trying to compile the largest online snapshot..
For 2019 the Centre has prepared a diverse programme of events, which includes residential retreats, foreign language group retreats and day events. Last year, we released the Krishnamurti Video Collection on our YouTube channel and during the last six months, we have released 400 audio recordings, free to the world. Alumni, visit our new 50th Anniversary Reunion website and register today for this special event, due to take place from 15th to 19th August. 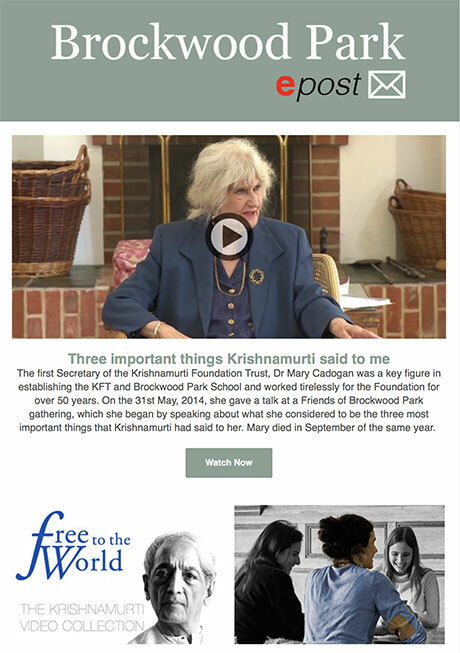 The Trustees of the Krishnamurti Foundation Trust Ltd, who also act as Governors of Brockwood Park School, wish to announce changes to the management and staffing of the Schools. 50 years ago, on the morning of the 2nd July in Saanen, Switzerland, just prior to Krishnamurti’s second talk, an announcement was made to the assembled audience. A decision had been taken. Vinay Swamy invites alumni on a vivid journey through the Brockwood ‘land(mind)scape’ in order to rediscover what it meant to be a student here and what it could mean to help a student now. The new Annual Report provides an overview of the activities of the different departments at Brockwood for the financial year 2016-2017. 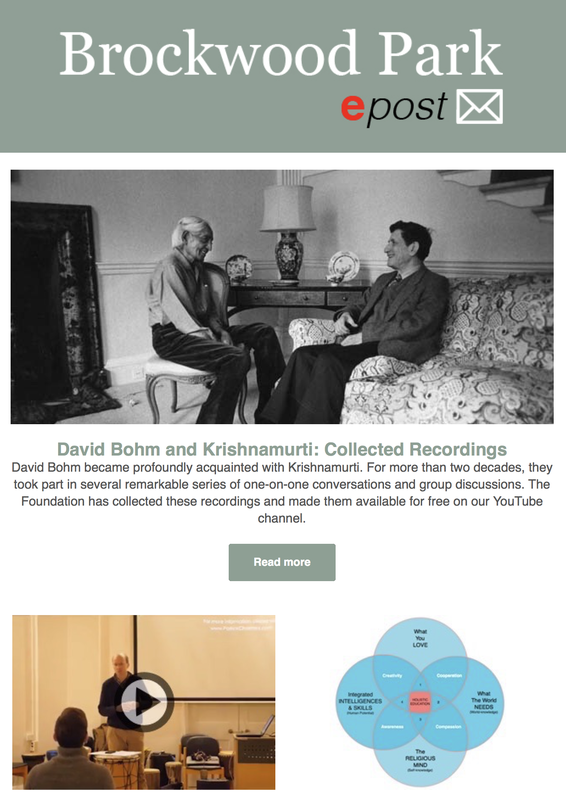 David Bohm became profoundly acquainted with Krishnamurti. For more than two decades, they took part in several remarkable series of one-on-one conversations and group discussions. The Foundation has collected these recordings and made them available for free on our YouTube channel. 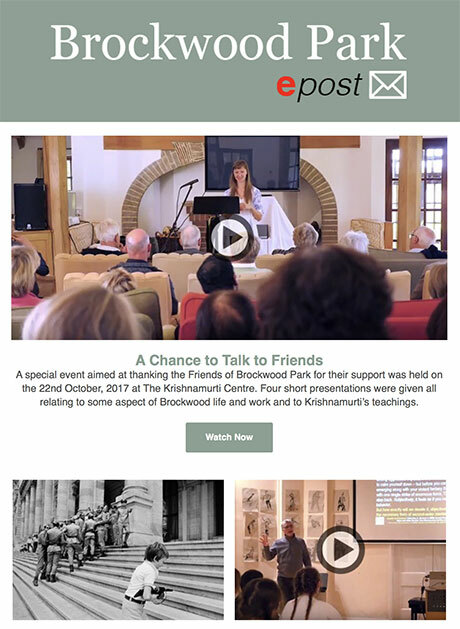 All Hands On features short films looking at the crisis in Western democracy and real-life remedies to its problems..
A special event aimed at thanking the Friends of Brockwood Park for their support was held in October, 2017 at The Krishnamurti Centre. Four short presentations were given all relating to some aspect of Brockwood life and work and to Krishnamurti’s teachings. The guest presenter at the Friends Gathering in October was Mark Edwards, one of the few environmental communicators to have personally witnessed the global issues that are defining the 21st century. One of the world’s leading researchers/ scholars on Philosophy of Mind, Prof. Thomas Metzinger, gives a Present Tense talk to staff and students exploring questions related to our sense of self, embodiment, avatars and artificial intelligence. Dr Mary Cadogan began by speaking about what she considered to be the three most important things that Krishnamurti had said to her. The complete collection, comprising almost 600 full-length videos, is now free to the world. From weekend events to day events, the Centre offers a substantial range of opportunities for guests to engage with the work of Krishnamurti. Parties generally leave you with a lot of cleaning up to do, but what happens when the purpose of the party is to clean up? Globally it has been a turbulent year with many alarming political, economic and social events. What does a Brockwood bursary mean to the student who receives it? Well, it is probably the difference between attending Brockwood and not attending Brockwood. A significant body of work from the exceptional watercolour artist David Evans has been bequeathed to the Krishnamurti Foundation. After 36 years working for the Krishnamurti Foundation Trust, Ray McCoy has retired. He will be greatly missed. 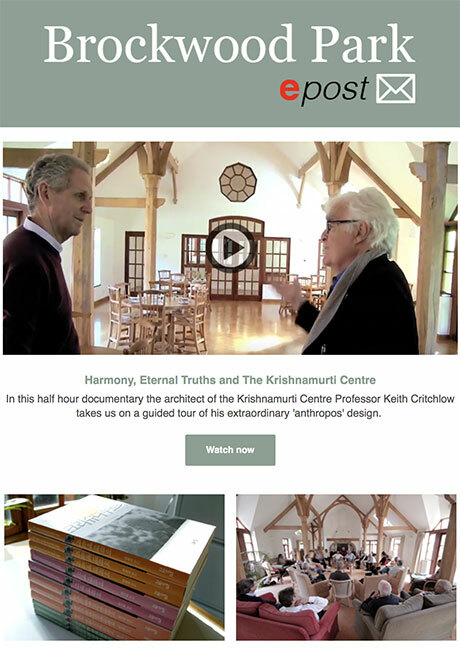 In this video the architect of the Krishnamurti Centre Professor Keith Critchlow takes us on a guided tour of his extraordinary ‘anthropos’ design. The KFT gives a summary of its mandate and recent activity. The Friends of Brockwood Park gathering is an event that intends to join donors and friends of Brockwood from all over the world. Using vectors and leaves Brockwood’s Maths Class excitedly constructed the word Brockwood in 3D letters across the South Lawn. 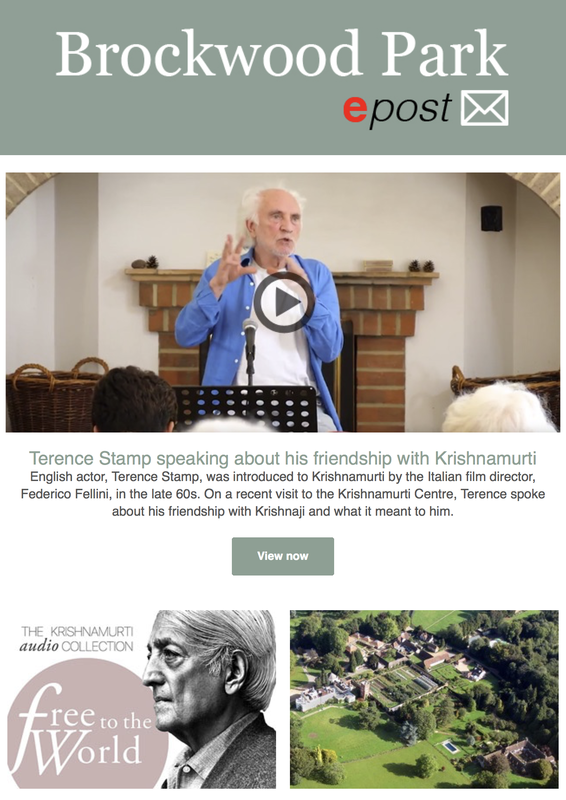 Subscribe to receive our annual Foundation Bulletin and news related to the activities of Krishnamurti Foundation Trust.